Which Is Worse: Misusing a Credit Card or Never Opening One at All? If you have trouble controlling your spending, you may be wondering if it’s a good idea to open a credit card. After all, it’s reasonable to want to limit the temptation to get into debt. But it’s important to remember that failing to establish a credit history can also be dangerous to your financial future. 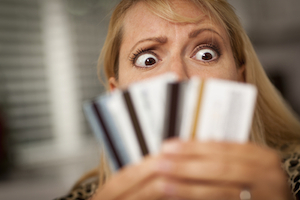 So which is worse: Using a credit card irresponsibly, or never using one at all? Take a look at the Nerds’ analysis below – the answer might surprise you. Before discussing the relative merits of avoiding versus mishandling credit cards, it’s important to make one thing clear: Neither is a good course of action. In an ideal world, everyone would get a credit card as early as possible in their financial lives, use it responsibly and build good credit. In fact, many people do this successfully. However, we recognize that this isn’t everyone’s reality. Some people struggle with spending within their means and end up faced with the tough choice between getting into debt or missing out on establishing a credit history. Consequently, the Nerds decided to tackle this difficult topic. Let’s start by discussing why misusing and avoiding credit cards each have a different and negative impact on your credit score. Paying bills late: This will count against the 35% of your credit score that comes from paying your bills on time. Defaulting: Failing to make payments at all and ending up with a charge-off on your credit report will result in a big loss of points. Also, it could hang around on your report for up to seven years. Charging too much: Getting into credit report hurts the 30% of your score that’s determined by your credit utilization ratio. If you’re using more than 30% of your available credit, your score is getting dinged. Plus, carrying a balance from month-to-month will cost you big bucks in interest. Opening too many cards at once: A lot of people get overzealous with credit card applications, but too many recent credit inquiries will cost you points on your credit score. Avoiding credit cards altogether – Fifteen percent of your credit score is determined by the length of your credit history. Since opening a credit card is the easiest way for most people to establish credit, failing to do so makes it difficult to bolster this portion of your score. The longer you wait to get started with credit, the harder it will be to get a loan later on. Nerd note: It is possible to start establishing credit without getting a credit card. You could get a loan from a bank to make a purchase. However, if you’re new to credit, this might be hard without a cosigner. This is why we always say that getting a credit card is the easiest and best way to build credit from the ground up – other methods are much trickier. Given that so much can go wrong if you misuse a credit card, you might be surprised that the Nerds actually think it’s worse to never open a credit card at all. How could avoiding plastic really be that bad? The answer is simple: Almost any bad deed committed with your card can eventually be fixed, undone or forgotten. Even if you got into such serious debt that you had to declare bankruptcy, after 10 years it would drop off your credit report. But you can’t go back in time and change the date you got your first card. As a result, we think that never using a credit card is potentially more damaging to your financial health than mismanaging plastic you’ve opened in your name.